Bayer is a global enterprise with core competencies in the Life Science fields of health care and agriculture. Its products and services are designed to benefit people and improve their quality of life. At the same time, the Group aims to create value through innovation, growth and high earning power. Bayer is committed to the principles of sustainable development and to its social and ethical responsibilities as a corporate citizen. For more information, go to www.bayer.us. It may start with a simple effervescent tablet, some water and a film canister, but building an Alka Rocket may be the activity that inspires more kids to pursue studies that turn them into the next generation of innovators. 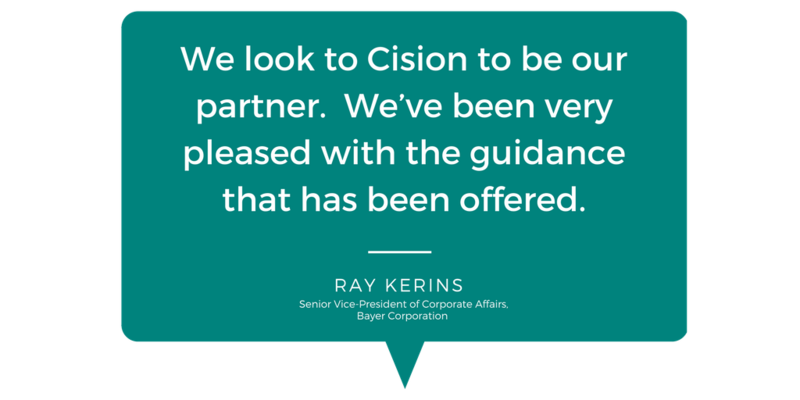 To test that theory — and to take the PR impact of its longstanding investment in STEM skills to a new stratosphere — Bayer determined MultiVu, a Cision company, along with Cision Distribution by PR Newswire’s services was the perfect launchpad. According to Ray Kerins, Bayer’s Senior Vice-President of Corporate Affairs, an idea came to him on the drive into work one day: what if the concept of an Alka Rocket could be taken further? How high could it go, given an incentive to apply some of the most creative thinking among U.S. students? The first step was to partner with the Big 10 Athletic Conference, the oldest Division I collegiate athletic conference in the United States, which includes some of the best engineering departments and leads the county in PhD completion in STEM fields. In addition, six of the Top 10 agriculture-producing states in the U.S. include Big Ten universities. Perhaps even more critical was spreading the word about the unique and fun opportunity students who chose to participate could have. “We knew we had a great program, we just wanted guidance on how to make sure we could share it with the most people across the U.S. as humanly possible,” Kerins said. 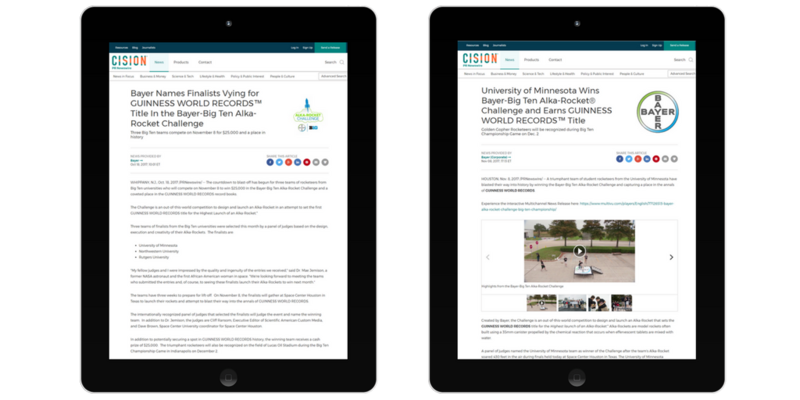 Bayer turned to Cision’s MultiVu and PR Newswire arms that create compelling stories like the Alka Rocket Challenge to key media outlets via the most popular newswire in the world. MultiVu includes creative video and social content production services to ensure stories are told in the ways most likely to drive engagement within a particular audience. The initial press release about the Alka Rocket Challenge — which included a high-quality image showcasing its partnership with the Big Ten, along with an animated video — garnered 220 pickups and a total potential audience reach of more than 87 million. The final release in the campaign, which announced the University of Minnesota as the winner, got even more pickups (243), more than 16,000 views, more than 2,000 video views, and more than 3,200 video embeds. 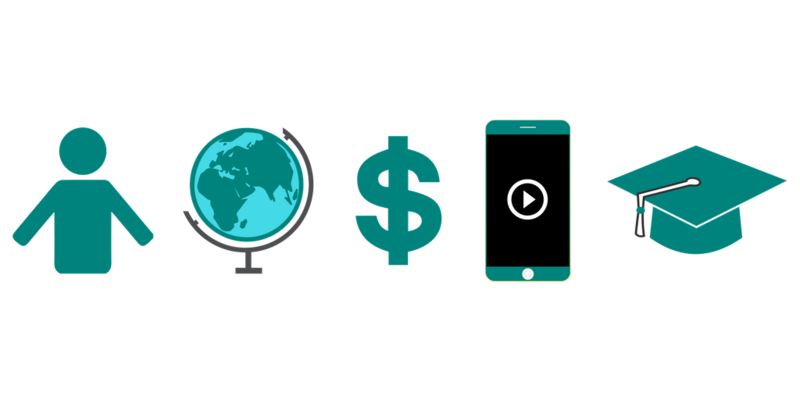 Industry Insights For Demographic Targeting: Cision’s MultiVu team recommended the video and image assets that proved so popular as part of the campaign — advice Kerins said he appreciated. Segmentation Strategies For Specific Moments: While the first and second release in the project were intended for outlets that reach Millennials, the final release was aimed at the general public, as well as state and federal legislators who are also interested in advancing STEM skills across America. Working with MultiVu ensured all messaging made sense depending on when it became part of the storytelling journey. Following what he describes as the “tremendous pickup” of the news release announcing the winner, Kerins says Bayer has been getting outreach from other schools, not just those who are part of the Big Ten. In other words, there’s no telling how far the Alka Rocket Challenge might go.